Vertical Rise Fiberglass Door | Dock Door Systems Inc. The Vertical Rise door system is a custom designed door where there are side room constraints, but enough ceiling space. They fit where swing doors or sliding doors won't work, or the area is too clean for a roll-up door. Exclusive all-stainless (no aluminum or other soft metals) heavy-duty track and nylon roller assembly. Continuous three-sided urethane gasket with bottom floor gasket. Electronic and mechanical locking options to meet stritest FDA/DEA requirements. 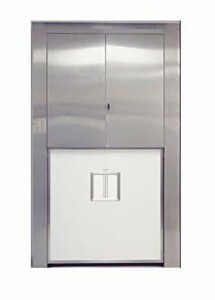 Powered Doors: Up to 8'0" x 8'0"
Structural molded seamless fiberglass panel with polyester gel-coat finish. Non-porous, non-shedding, and non-absorptive. Full perimeter gaskets: Non-marking gray vinyl. Heavy-duty 12 gauge, 304 #4 stainless steel side frames with integral stainless steel track. 7 gauge, 304 #4 Stainless steel header/motor assembly. 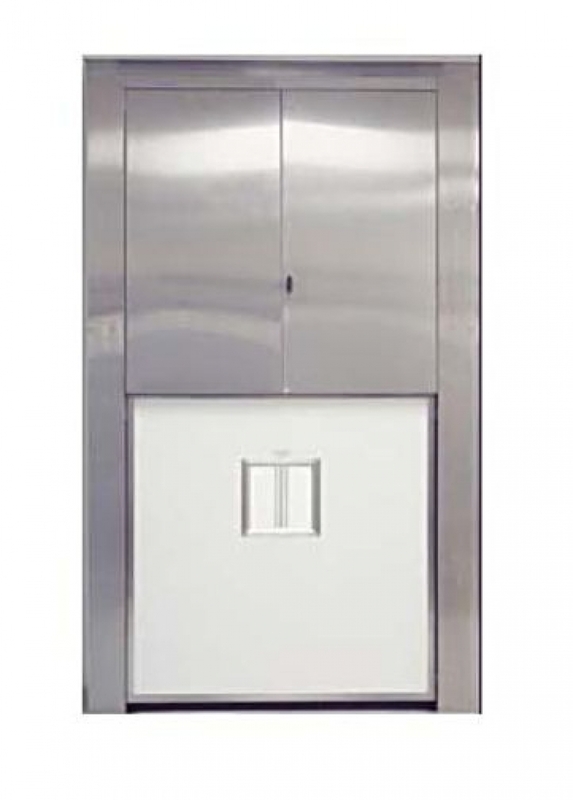 16 gauge, 304 #4 stainless steel swinging maintenance panel and removable operator access cover. Complete System capable of mounting within the jamb or face mounted on the wall. 1/4 h.p. heavy-duty electromechanical operator - PLC/VFD controlled. Mounted in separate NEMA 4x control box. Manual operation during unexpected power outages. SofTouch™ electric reversing edge for instant stop and reverse. Standard pushplate to open, time delay to close.